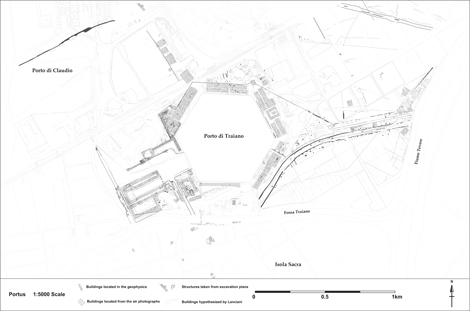 Geophysical survey is a technique that allows us to gain an impression of what lies beneath the soil and, at once, learn about the layout of many buried buildings at Portus. The earliest phase of AHRC-funded research at the site comprised a survey of the whole core area of the port and its hinterland to the east. It began in 1998, was completed in 2003 and was published in 2005. It entailed a magnetometer study which systematically recorded localized magnetic anomalies relating to buried buildings to a depth of 1.2m. 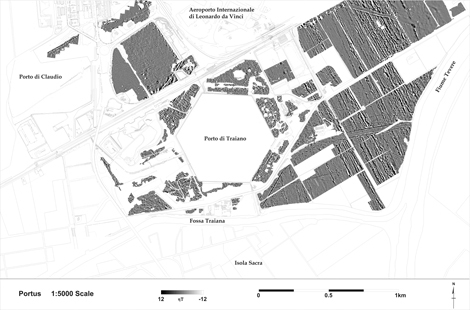 The survey covered 220 hectares and revealed new buildings, therein adding detail to known structures clustering around the Claudian and Trajanic basins. It also provided new information about the hinterland of the port lying between the hexagonal Trajanic basin and the Tiber, including evidence of the line of an aqueduct, road and canal, warehouses and a river port.